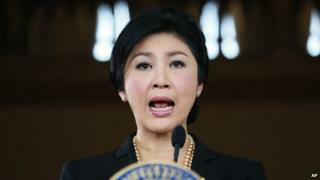 Thailand's Prime Minister Yingluck Shinawatra has issued a statement denying charges of corruption in connection with a controversial rice purchase scheme. Thailand's anti-corruption commission said on Tuesday that it would charge her for her role in the scheme. If found guilty she could be forced from office. Meanwhile, anti-government protesters have continued their campaign to oust Ms Yingluck. "I reaffirm that I am innocent of the accusations by the NACC [the anti-corruption commission]," Ms Yingluck said on her official Facebook page. "Even though I am accused of criminal charges and face removal [from office], which were the wishes of people who want to overthrow the government, I am willing to co-operate to establish the facts," she added. Thailand has been in a political crisis since mass protests began in November. Little has been heard from the Thai prime minister in recent days, as she's moved between secret locations, avoiding the protest movement trying to unseat her. Now she has broken her silence, in response to the National Anti-Corruption Commission's statement that it would charge her in connection with her government's rice purchase scheme. Opposition politicians say this has allowed huge sums of money to be siphoned off illegally. Ms Yingluck insists she is innocent - she was in charge only of formulating the policy, she said, not the day-to-day running of the scheme. Police had cleared some protest sites in Bangkok last week, dismantling barricades near some government buildings with little resistance. Protesters, however, soon regrouped. On Monday, thousands of demonstrators gathered outside the prime minister's office, Government House, cementing the gates shut in a bid to stop officials returning to work in the building. The rice purchase scheme has seen the Thai government buying farmers' crops for the past two years at prices up to 50% higher than world prices. The policy was popular with farmers. However, it has led to Thailand's rice exports being badly hit, and critics say the scheme is too costly and vulnerable to corruption. Farmers - Ms Yingluck's natural backers - have recently demonstrated themselves, angry that they have not received payment under the scheme. Correspondents say the government blames the delayed payments on the protesters, as it cannot borrow money to make the payments until a new parliament has convened.